WASHINGTON - Up against a deadline, Congress passed and sent a waiting President Obama legislation late Wednesday night to avoid a threatened national default and end the 16-day partial government shutdown, the culmination of an epic political drama that placed the U.S. economy at risk. The Senate voted first, a bipartisan 81-18 at midevening. That cleared the way for a final 285-144 vote in the Republican-controlled House about two hours later on the legislation, which hewed strictly to the terms Obama laid down when the twin crises erupted more than three weeks ago. Among Philadelphia-area senators, Pat Toomey (R., Pa.) cast the only "no" vote. Joseph R. Pitts (R., Pa.) was the only area representative to vote against the bill in the House. The legislation would permit the Treasury to borrow normally through Feb. 7 or perhaps a month longer, and fund the government through Jan. 15. More than two million federal workers would be paid - those who had remained on the job and those who had been furloughed. The White House budget office said that federal workers should plan to return to work Thursday morning. After the Senate approved the measure, Obama hailed the vote and said he would sign it immediately after it reached his desk. "We'll begin reopening our government immediately and we can begin to lift this cloud of uncertainty from our businesses and the American people." "Hopefully next time it won't be in the eleventh hour. One of the things that I said throughout this process is, we've got to get out of the habit of governing by crisis," Obama said. Later, in the House, Rep. Harold Rogers (R., Ky.) said: "After two long weeks, it is time to end this government shutdown. It's time to take the threat of default off the table. It's time to restore some sanity to this place." The stock market surged higher at the prospect of an end to the crisis that also had threatened to shake confidence in the U.S. economy overseas. Republicans conceded defeat after a long struggle. "We fought the good fight. We just didn't win," conceded House Speaker John A. Boehner (R., Ohio) as lawmakers lined up to vote on a bill that includes nothing for GOP lawmakers who had demand to eradicate or scale back Obama's signature health-care overhaul. "The compromise we reached will provide our economy with the stability it desperately needs," said Senate Majority Leader Harry Reid (D., Nev.), declaring that the nation "came to the brink of disaster" before sealing an agreement. Senate Republican leader Mitch McConnell, who negotiated the deal with Reid, emphasized that it preserved a round of spending cuts negotiated two years ago with Obama and Democrats. As a result, he said, "government spending has declined for two years in a row" for the first time since the Korean War. "And we're not going back on this agreement," he added. Only a temporary truce, the measure set a time frame of early next winter for the next likely clash between Obama and the Republicans over spending and borrowing. But for now, government was lurching back to life. In one example, officials met to discuss plans for gearing back up at the Department of Housing and Urban Development, where 307 employees remained at work during the shutdown and more than 8,000 were furloughed. After weeks of gridlock, the bill had support from the White House, most if not all Democrats in Congress and many Republicans fearful of the economic impact of a default. Boehner and the rest of the top GOP leadership told their rank and file they would vote for the measure, and there was little or no doubt it would pass both houses and reach the White House in time for Obama's signature before the administration's 11:59 p.m. Oct. 17 deadline. That was when Treasury Secretary Jacob Lew said the government would reach the current $16.7 trillion debt limit and could no longer borrow to meet its obligations. Tea party-aligned lawmakers who triggered the shutdown that began on Oct. 1 said they would vote against the legislation. Significantly, though, Texas Sen. Ted Cruz and others agreed not to use the Senate's cumbersome 18th-century rules to slow the bill's progress. In remarks on the Senate floor, Cruz said the measure was "a terrible deal" and criticized fellow Republicans for lining up behind it. McConnell made no mention of the polls showing that the shutdown and flirtation with default have sent Republicans' public approval plummeting and have left the party badly split nationally as well as in his home state of Kentucky. He received a prompt reminder, though. "When the stakes are highest Mitch McConnell can always be counted on to sell out conservatives," said Matt Bevin, who is challenging the party leader from the right in a 2014 election primary. More broadly, national tea party groups and their allies underscored the internal divide. The Club for Growth urged lawmakers to vote against the congressional measure, and said it would factor in the organization's decision when it decides which candidates to support in midterm elections next year. "There are no significant changes to Obamacare, nothing on the other major entitlements that are racked with trillions in unfunded liabilities, and no meaningful spending cuts either. If this bill passes, Congress will kick the can down the road, yet again," the group said. Even so, support for Boehner appeared solid inside his fractious rank and file. "There are no plots, plans or rumblings that I know of. And I was part of one in January, so I'd probably be on the whip list for that," said Rep. Thomas Massie of Kentucky. The U.S. Chamber of Commerce came out in favor of the bill. Simplicity at the end, there was next to nothing in the agreement beyond authorization for the Treasury to resume borrowing and funding for the government to reopen. 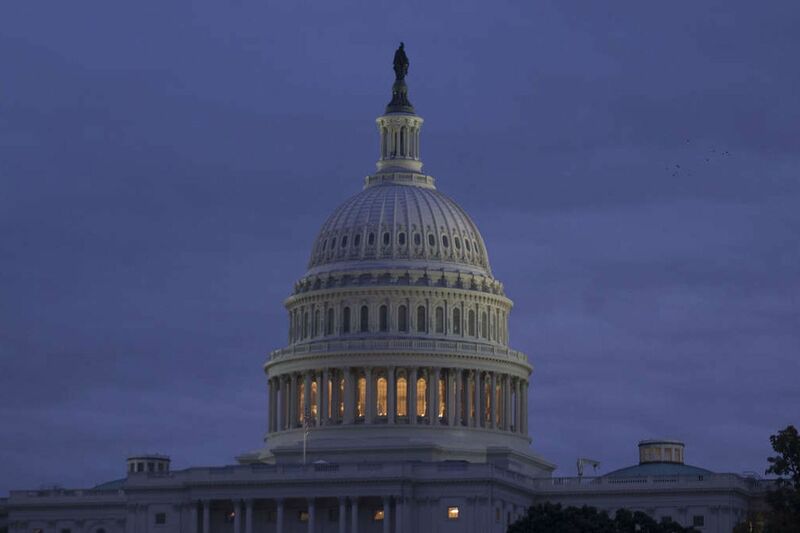 House and Senate negotiators are to meet this fall to see if progress is possible on a broad deficit-reduction compromise of the type that has proved elusive in the current era of divided government. Additionally, Health and Human Services Secretary Kathleen Sebelius is to be required to produce a report stating that her agency is capable of verifying the incomes of individuals who apply for federal subsidies under the health-care law known as Obamacare. Obama had insisted repeatedly he would not pay "ransom" by yielding to Republican demands for significant changes to the health-care overhaul in exchange for funding the government and permitting Treasury the borrowing latitude to pay the nation's bills. Other issues fell by the wayside in a final deal, including a Republican proposal for the suspension of a medical device tax in Obamacare and a Democratic call to delay a fee on companies for everyone who receives health coverage under an employer-sponsored plan. The gradual withering of Republicans' Obamacare-related demands defined the arc of the struggle that has occupied virtually all of Congress' time for three weeks. The shutdown began on Oct. 1 after Cruz and his tea party allies in the House demanded the defunding of the health law as a trade for providing essential government funding. Obama and Reid refused, then refused again and again as Boehner gradually scaled back GOP demands. As Republican polls sank, Boehner refused to let the House vote on legislation to reopen the entire government, insisting on a piecemeal approach that the White House and Reid rejected as insufficient. As the Oct. 17 debt-limit deadline approached, there were warnings from European officials as well as cabinet members and bankers in this country that failure to raise the debt limit invited an economic disaster. Reopen the government and fund it through Jan. 15, 2014. Raise the debt limit until Feb. 7, 2014, but allow federal borrowing to continue for a few weeks longer, using special accounting measures. Require additional measures, favored by Republicans, to ensure that people who receive financial help in buying health insurance under the Affordable Care Act are being honest about their income. Set up a negotiating committee to try to come up with a longer-term budget plan. The committee would be expected to issue budget recommendations by Dec. 13. Provide back pay to furloughed federal workers. Representatives from the Philadelphia area who voted for the debt-ceiling bill were Robert E. Andrews (D., N.J.), Robert A. Brady (D., Pa.), John Carney (D., Del. ), Matt Cartwright (D., Pa.), Charles W. Dent (R., Pa.), Chaka Fattah (D., Pa.), Michael Fitzpatrick (R., Pa.), Jim Gerlach (R., Pa.), Frank A. LoBiondo (R., N.J.), Pat Meehan (R., Pa.), Jon Runyan (R., N.J.), Allyson Y. Schwartz (D., Pa.), and Christopher H. Smith (R., N.J.).